Whether you’re playing live or recording in the studio, it’s important to have a microphone that can give you a clear and accurate representation of your lyrics. The problem is that there are thousands of great vocal microphones to fit the endless different types of voices. Some great vocal microphones are specifically designed to offer the most honest, accurate representation of a singer’s voice. Others will have a small bump in the higher frequencies to help the singer feel more “forward” in the mix. Finding the right vocal microphone isn’t always as easy as buying the most expensive or even the best reviewed. You need to make sure that you’re picking up a microphone that fits the singer’s tonal qualities and role in the band. We’ve put together a list of some of our favorite vocal microphones in order to help you find the best vocal mic for you. Generally, microphones come in three varieties: dynamic, condenser, and ribbon. Dynamic microphones are the least common in a recording setting but there are a few examples of dynamic microphones that offer great results. Dynamics are the most durable and can be banged around a little more than the other styles. On the flip side, they generally aren’t as tonally accurate as other microphones. Condenser microphones, on the other hand, are probably the most common style used for recording vocals. With a good condenser mic, it’s easier to create the presence bump that allows the vocals to sit forward in a mix. 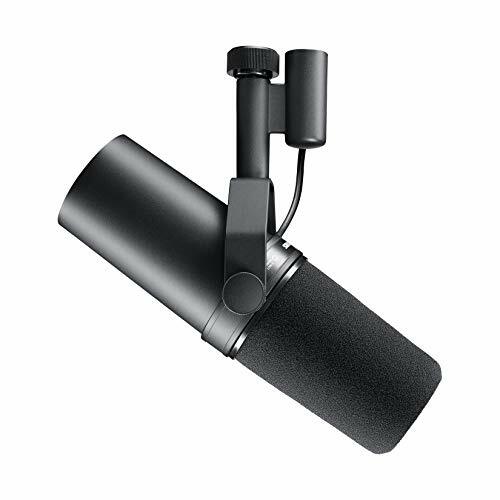 They aren’t as durable as dynamic microphones but if they’re primarily being used in a studio, it’s unlikely that they will really suffer any damage they can’t handle. Most people consider condensers to be the best microphone for vocals. The last kind of microphone is the ribbon microphone. Ribbons are also a pretty common choice when recording vocals. They have a warmer sound that can work really well in a sparse or acoustic mix. They are incredibly delicate, though. Many of them can be damaged by loud sound sources or even having phantom power running into the microphone. First and foremost, a vocal microphone should be an extension of your voice. No matter how well-built a vocal microphone is, no microphone will sound good on all voices. Anytime you walk into a professional studio to record, they will start by doing a “shootout”. This means they set up five or more microphones and have you sing through each of them so they can find the microphone that best suits your voice and recording. Unfortunately, not everybody will have the chance to try out the most popular vocal microphones first hand. If you understand how to read some of the specs, you can get a general idea without the microphone in your hand if you know what kind of recording you are going for and what type of voice you have. If you are going to have a dense mix, commonly seen in pop, rock, and modern country music, you’ll want to make sure that you have a microphone that will cut through all the extra sounds. This is usually referred to as an “airy” microphone. These are most commonly Large Diaphragm Condenser microphones with a low self-noise and a bump in the frequencies between 6-10 kHz. Condenser microphones are also good choices for very aggressive singers due to their high SPL (sound pressure level) ratings while still offering a lot of clarity. Oftentimes, condenser microphones will be the most versatile. They can offer features like bass roll off, pads, or even variable polar patterns. These features essentially give you multiple microphones built into one housing. Condenser microphones are the only type that requires phantom power. Phantom power is essentially an electrical current that runs through the microphone cable to boost the output power of the microphone up to a usable level. Make sure whatever gear you’re running your microphone into offers that feature. In a sparse mix, like acoustic settings, you may want something that will blend more. I’ve found that if I have a microphone that is too forward in small mixes, it can make the recording feel disconnected. A warmer microphone can glue the vocals to guitar better. This is where ribbon microphones can add a lot of value. Due to their design, ribbon microphones are typically very accurate but they do have a lot of proximity effect. A good sound engineer should be able to use this to his or her advantage. The closer the singer is to the sound source, the warmer the sound will be. Unfortunately, ribbons can be very sensitive. You’ll want to make sure that you have a pop filter in order to protect the ribbon inside of the microphone. Many classic rock recordings favored large diaphragm dynamic microphones. They can work well in a dense setting where you don’t necessarily need the vocals to be the focal point. Unlike pop music, rock bands will often have drummers and guitarists that are as respected (if not more respected) than the vocalist. Sometimes, the lyrics will even take a backseat to the overall groove and vibe of the song as a whole. In this case, dynamic microphones can work well. They aren’t as crisp or clear as a condenser and not as warm as a ribbon. When used well in a dense mix, dynamic microphones can create a great vocal sound without pushing the rest of the band too far into the background. The Shure SM7B is a legendary dynamic microphone that was originally designed to be a broadcast microphone. However, as time went on, it started to find its way into recording studios as a vocal microphone. What may be its greatest claim to fame was that it was used to record Michael Jackson’s vocals on his Thriller album, but this microphone has also been involved in many other Grammy-winning recordings. 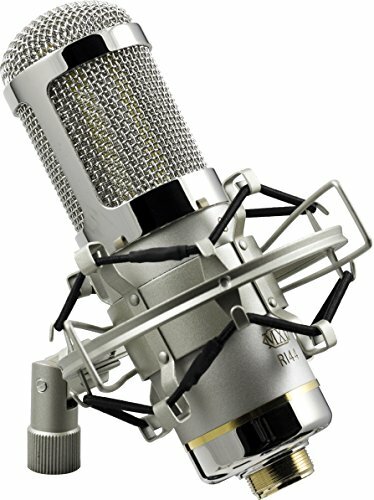 For all of its strengths and claims to fame, this mic is still in the lower mid-range in price. It’s the most expensive microphone on the list but not by much. It has a frequency response of 50 Hz to 20 kHz which will easily cover the range of your standard singer. The popularity of this microphone comes from the gentle presence boost which is immediately followed by a gentle roll off in the higher frequencies which creates smooth, warm vocal tracks. It also has the option of bass roll off switch can add a nice effect to many vocals. Being a dynamic microphone, the SM7B is more durable than many high-end microphones. This microphone works well with all types of singers, but works especially on people with a nasal quality in their voice. With its low price and quality performance this microphone is a top contender for the best recording microphone for vocals. 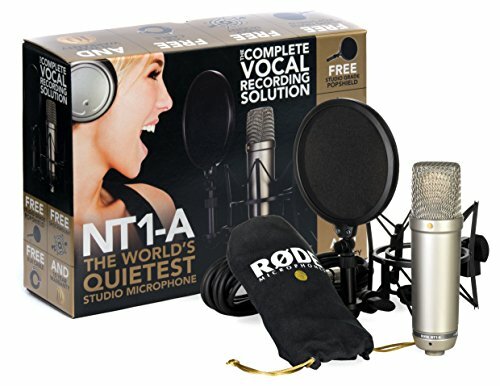 The Rode NT1A microphone is ideal for softer vocals and vocalists that have a very large dynamic range. It has a transformerless design, which helps this microphone have minimal self-noise. So if you have a singer that seems to almost be whispering while tracking, you can raise the gain on your preamp without getting any hum from this microphone. On the other hand, this microphone also offers a maximum SPL of 137 dB so it can handle singers belting without distortion. The NT1A has a frequency range of 20 Hz to 20 kHz, so it can really handle anything you throw in front of it. With that said, the frequency readout isn’t very flat. It has a slight bump at 100 Hz and then another bump at around 3 kHz to 10 kHz. If you leave it as is, the microphone can come across a little brittle. However, if you EQ the higher frequencies down a little, the 100 Hz bump can give your vocal tracks a little warmth. I find that this microphone can work well with a singer that has excellent articulation. However, if your singer is a bit of a mumbler, you may be stuck with muddy vocals if you EQ the higher frequencies down too far. 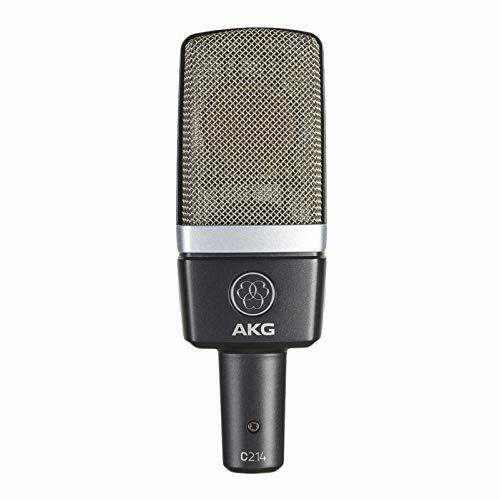 The AKG C214 features the same capsule as the C414, which is a mainstay in nearly every professional recording studio. The most noticeable difference between the two microphones is that the C414 has a variable polar pattern whereas the C214 is a fixed cardioid pattern. To be honest, every time I’ve used the C414 I’ve used it in cardioid, so for less than half the price the C214 makes a lot of sense. This microphone has a frequency response of 20 Hz to 20 kHz. The frequency response generally stays flat until about 15 kHz where there is a slight bump. The lower frequencies are very slightly raised with a subtle dip around 11 kHz. I’ve found that this microphone really seems to excel on low vocals. It’s difficult to find a microphone that can naturally give bass and baritone vocals a forward feel and the C214 does exactly that. This microphone also features a 20 dB pad and a 160 dB bass cut. When paired with the 156 dB max SPL, you’ll find that this microphone works very well on bass and guitar cabs. If you’re looking for a vocal microphone that you can also use for a bunch of other applications, the C214 is a great choice. If you’re less interested in finding the right vocal microphone for you personally and more interested in finding a microphone that can handle a variety of voices, take a look at the Audio Technica 2050. The AT2050 offers a variable polar pattern. You can switch the microphone to cardioid (which picks up sound directly in front of the microphone), Figure 8 (which picks up sound from both the front and back of the microphone), and omnidirectional (which picks up sound in a full circle around the microphone). In each setting, the microphone’s frequency response ranges between 20 Hz and 20 kHz. However, in each setting, the frequency read out will be a little bit different. It also features a 10 dB pad switch and a bass roll off at 80 Hz. It also has a fairly low self-noise max SPL at 149 dB. All in all, the AT2050 is the most versatile microphone on this list, and it’s easily one of the best microphones for singers of all types. It’s perfect for anybody that is more interested in engineering and recording a variety of other people rather than finding the perfect fit for their specific voice. This mic can fill many roles comfortably and also gives you a chance to experiment with different polar patterns. I have been consistently impressed with MXL products. 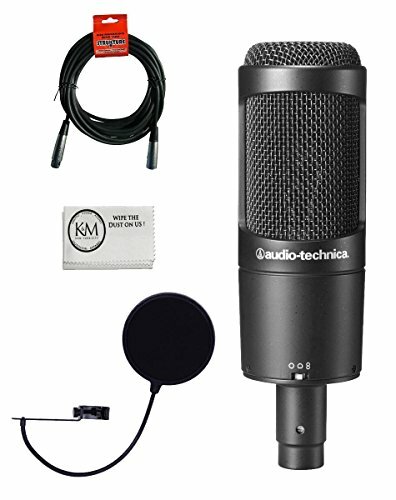 They are able to offer microphones at entry level prices that perform well enough for a professional studio. And the MXL R144 is the perfect example. This is a ribbon microphone that costs a tenth of the price of industry standard ribbon mics. But it captures sound right up there with the big boys, and it gets consistently good reviews from musicians and sound engineers. This mic has a slightly diminished frequency response ranging from 20 Hz to 17 kHz. Its frequencies are strongest in the lower registers with a slight dip in the upper midrange frequencies. Like all ribbon microphones, it has a figure eight polar pattern and will require a preamp that can offer a lot of gain, since ribbons tend to have a pretty low output. This microphone will work best if you want to be able to track warm, full-sounding vocals. Acoustic sessions or a cappella sessions will be ideal. If you use a ribbon microphone in a busy pop or rock mix, it can quickly sound muddy. This mic can also offer a really attractive vintage sound that I like to use on jazz vocals. As you get closer to a ribbon microphone, the proximity effect will become more pronounced and can work really well if you have a “crooner” style singer. Getting good vocal tracks may be the most essential part of having a professional-sounding recording. There are a lot of microphone varieties designed to fit different voices and genres. Finding the best vocal recording microphone for you or your sound source will take time and experience. Make sure to try out different placements and different rooms to be able to explore all the variety that you can get from your microphone. You will need to take time to research and experiment before you decide on the best vocal mic for you, but this list should give you a good starting point for finding your perfect sound.